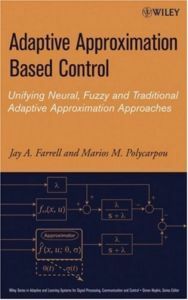 A highly accessible and unified approach to the design and analysis of intelligent control systems Adaptive Approximation Based Control is a tool every control designer should have in his or her control toolbox. Mixing approximation theory, parameter estimation, and feedback control, this book presents a unified approach designed to enable readers to apply adaptive approximation based control to existing systems, and, more importantly, to gain enough intuition and understanding to manipulate and combine it with other control tools for applications that have not been encountered before. The authors provide readers with a thought-provoking framework for rigorously considering such questions as: * What properties should the function approximator have? * Are certain families of approximators superior to others? * Can the stability and the convergence of the approximator parameters be guaranteed? * Can control systems be designed to be robust in the face of noise, disturbances, and unmodeled effects? * Can this approach handle significant changes in the dynamics due to such disruptions as system failure? * What types of nonlinear dynamic systems are amenable to this approach? * What are the limitations of adaptive approximation based control? Combining theoretical formulation and design techniques with extensive use of simulation examples, this book is a stimulating text for researchers and graduate students and a valuable resource for practicing engineers.